If you are a Blogger user, I want to discuss the two cases with context to Content management on Blogger. Blogger users may have came across through accidental delete of posts or pages, which may occur due to a human mistake or technical problem. Of course, you can recover the deleted content through Google cache and put it in a new post. But how about that ‘404 not found’ error which will appear when someone visits that deleted post from search engines and social media? That not found error will not only leave a bad impression on the visitors and search engines, but also throw that post or page out of search rankings. The situation gets worse when you have a lot of posts deleted by accident, and in such a case, you may lose majority of traffic, revenue etc. Note: Blogger doesn’t provide a trash folder from where you can recover deleted content. If you’re thinking to create a new post, change it’s date schedule, and put in the same URL structure of Blogger permalinks as you had in the deleted post, this is not going to help, since the so created new post will always have a different permalink with some number automatically added at the end. If you have outdated content on your blog, you may want to delete it and redirect it to the new content. This will help users coming to your outdated content from different sources, to reach the new, updated content. Well, in both of the above cases, you want a redirection from that ‘not found’ URL to the new post you’ll create with the recovered content. 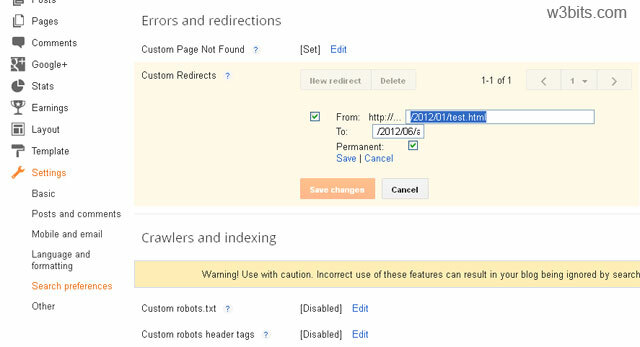 Blogger has introduced a new feature called Custom Redirects to overcome such problems. Here is how to use this feature. From your Blogger Dashboard, go to the Settings section of your blog by clicking the dropdown icon as shown below in screenshot. Next, enter the old (deleted or to be redirected) URL in the from field and the new (or destination) URL in the to field. Note: Input the only latter part of the URL in these from and to fields, eg. if you have myblog.blogspot.com/2013/01/post.html, put only /2013/01/post.html in the fields. Save changes or create more redirects as per your requirement. Now, check the redirect by visiting the old URL, you’ll see it is redirecting to the new URL. That’s it!